Summer Session Begins June 22nd! *All siblings under the age of 8 months are free with a paid sibling. *Your Tuition includes a CD and a sing-along family songbook. The tuition also includes access to the Music Together® Family Zone website, where you can download the current songs. 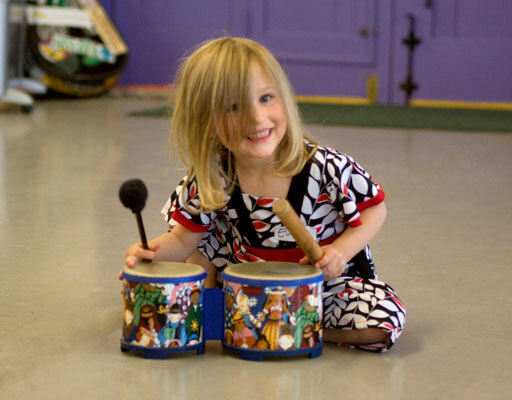 This is the essential Music Together class, one that a child can attend from birth through age seven. This basic class follows the recommendations of child development researchers—grouping children of a variety of ages because this fosters natural, family-style learning. Younger children enjoy watching and imitating older ones; older children learn by leading younger ones; and adults are happy because the children in the family can go to class together. Each child participates at his or her own level in singing, moving, chanting, listening, watching, or exploring musical instruments. Any caregivers—parents, grandparents, nanny—can bring the children. The whole family is welcome for this important family music experience. You can make up any missed classes by coming to another class that week or any other week during the session. Make-ups can be scheduled by clicking the link below. Classes cannot be carried to another semester and you are allowed up to 3 make-ups in any one semester. Space is limited so please be sure you do not drop in for make-ups but rather schedule them in advance. You can reach the administrative director by phone at 916-990-3222 or email at ccmusictogether@gmail.com with questions. In the case of an occasional special situation where you would like to bring a non-registered sibling to class with you, please check with the teacher/director in advance and pay the $10 sibling fee payable to "Capital City Music Together". Cash or check payment must be made and given to the teacher on the day you attend. If you would like to bring a new family with you to try out a class, please ask them to schedule a trial class on the website. No class on May 27th. No class will be held on April 4th.